A friend of mine asked me about felting yesterday. 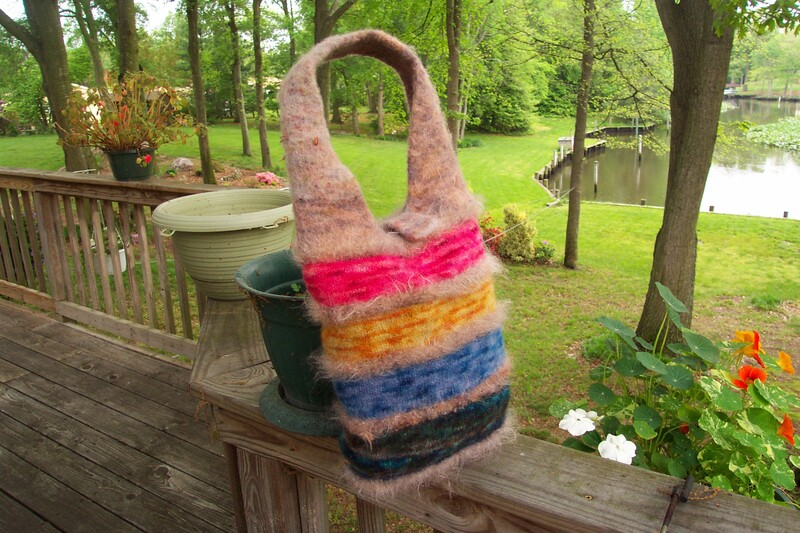 She made a bag to hang on her spinning wheel. Since I haven’t taken up spinning, I can’t really picture where it goes. But it needed felting so I thought I would include what I said here. My girl friend makes very nice yarn. 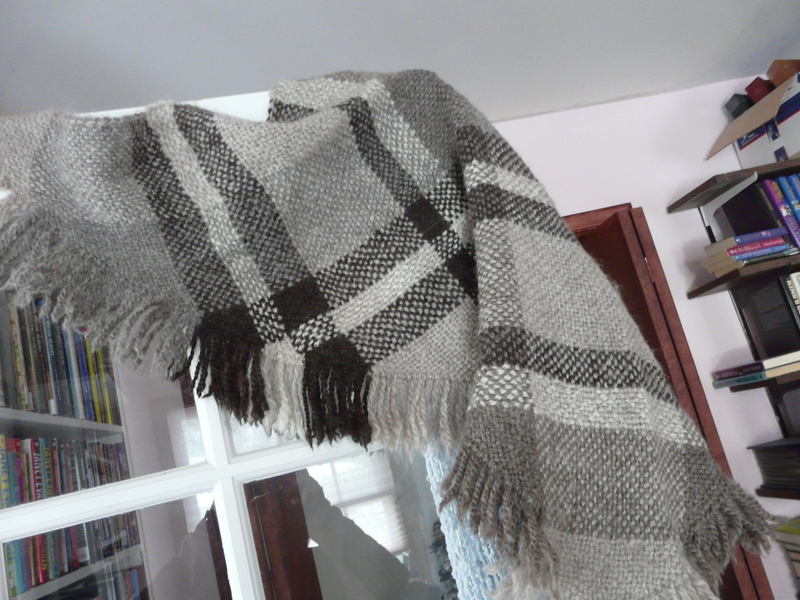 It knits up beautifully and is very easy on your hands. 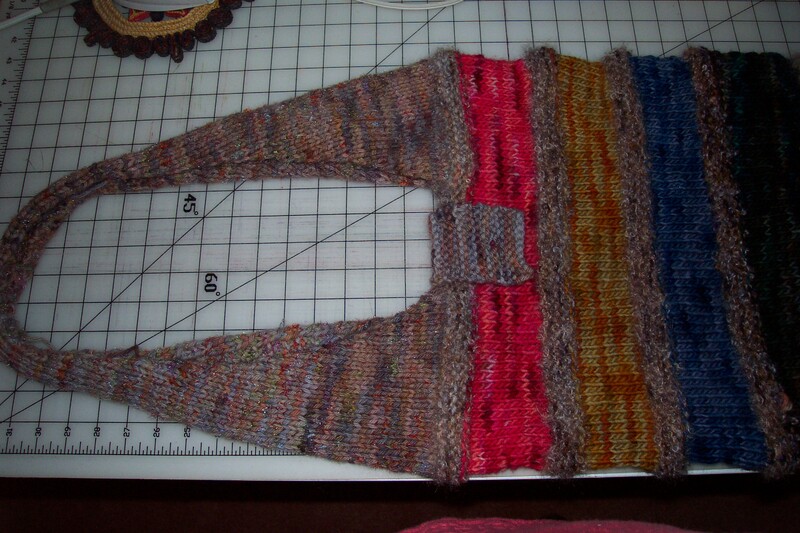 I made her a sweater with her yarn and she made me a very pretty triangular shawl that she wove. Right now, it’s hanging over the door to keep the cats off it. It is soft enough to wear on bare skin. I even like the fuzzy fringe–which Rue especially likes. Will I ever take up spinning? I really don’t think so. Do you have any idea how much yarn I have? Why do you think I’ve making all these hats? And do you know what spinning leads to? Dyeing! Weaving! I make myself crazy enough with the knitting and the sewing. I’d need another house. Wait a minute. I have another house. But, it’s two hours away and I don’t like living there. But my son is happy there. I need to get some sewing done. 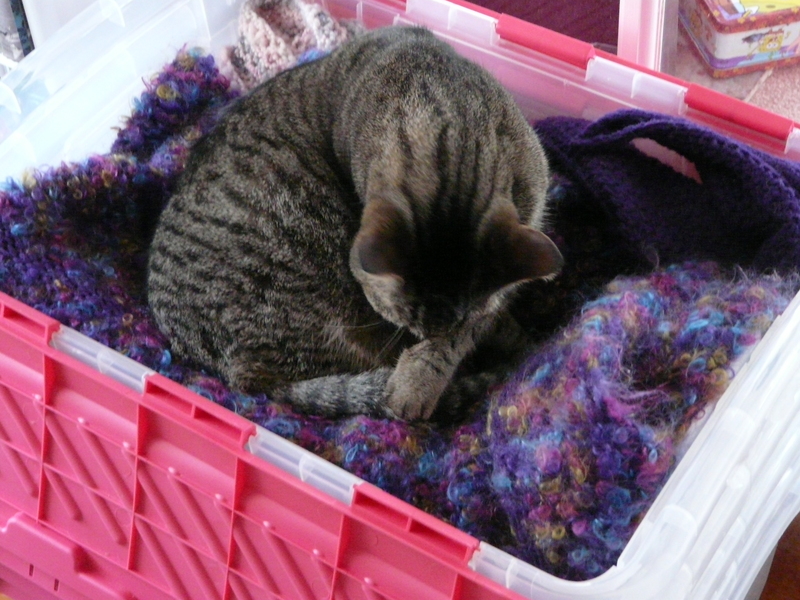 We had tossed a bunch of knitted items on my Sapphire while we were trying to organize the yarn. I tried to put some things in a storage box, but Flo decided that it was a great place to nap. Maybe tomorrow. I came up with another idea for a hat last night using Colinette Point Five yarn. I need to get the last hat written. Pattern writing takes a lot of time and I don’t like having to explain everything little thing. I feel like I’m saying the same thing over and over. Maybe over the summer I’ll make hats and try selling them on Etsy in the Fall. I could make matching scaves and/or mittens. I also have other things that were more fun to make than wear. Hmm…. Set your machine on HOT. Add a little soap or detergent. Don’t let it fill too much. Set it on Small or Medium. Remember, you will be sticking your hand in there. Set for at least 15 minutes. Stop it before it changes cycle. Pull it out and take a look. It probably won’t be shrunk enough yet. It usually takes my washer at least two cycles before it’s felted to where I want it. I also put in the empty Downy ball to help knock it around. I just stop the machine and reset it. After 5 minutes into the second cycle, I’ll start pulling it out at 5 minute intervals until it gets to where I want it. Then I let the machine do it’s thing. I set mine on two rinses. After the final spin, I shape it and stuff it with plastic bags to dry. I also stick a pen in the buttonhole. They only took one skein of yarn. I can still make a pair for me, too. They will be going out to Nancy as soon as we find an envelope to put them in. It’s weird how one looks bigger than the other. If Christine’s mittens are too big, she can always wear them the next time she does the dishes. A little scrubbing in some hot soapy water will do the trick. Then leave them on until they are dry and they should be just right. We sat out on the deck for a while this afternoon. I worked on the other baby gift. If anyone wants to see it, leave me your email and I’ll send a picture. I worked on my website a little last night. I did it all by myself with no ‘help’ from anyone and now my blogroll actually works. Who knows what I will tackle next.